Learn where to get safe cheats for your favorite online games, and keep your account safe! Don't get banned cheating online! You can have a ton of fun cheating in online games. Boost your score or Kill:Death ratio in first person shooters, rank up faster and get rare gear that would have taken hours longer to farm, and completely dominate the enemy when you play online! But there is a risk of cheating online. We Don’t Want This Happening To You! Unlike Singleplayer trainers, which are safe to use in singleplayer games and affect only your gaming experience, multiplayer game hacks and cheats can affect the experience of others in the game, and for this reason they are not usually allowed by the game developers. Stop reading here if you don’t want to break the game rules, and stick to singleplayer cheats and trainers! YIf you want to cheat in online games without getting your accounts banned, you need to use the right cheats that are undetected by the game and the anti-cheat. This means choosing which cheat you use carefully, as some cheats might even be detected before you load them into the game. But don’t worry, we’ll share some of the best cheats for multiplayer games like Battlefield 5, The Division 2, and others! The Best Undetected Game Hacks! Unlike public cheats that anyone can download (including the game developers), private cheats are more closed off communities where expert game hacking programmers create cheats for these games limited to their members only. Private cheat provides typically charge a monthly subscription fee for one or, all of the cheats they offer. Why Pay For Private Cheats? You might ask, why should I pay for private hacks when there are free ones online? That is a good argument if you never got banned for cheating, but it can quickly become a poor idea if you have to pay for a new copy of the game or lose all your in-game progression. Of course, you can be banned using paid cheats as well, but this is much less likely generally. You could also try to learn to code your own cheats using a popular tool like Cheatengine, but this could take years to learn to make engine hacks like those shown here. If you’re interested in learning to cheat, we suggest starting off with our free cheat creator. 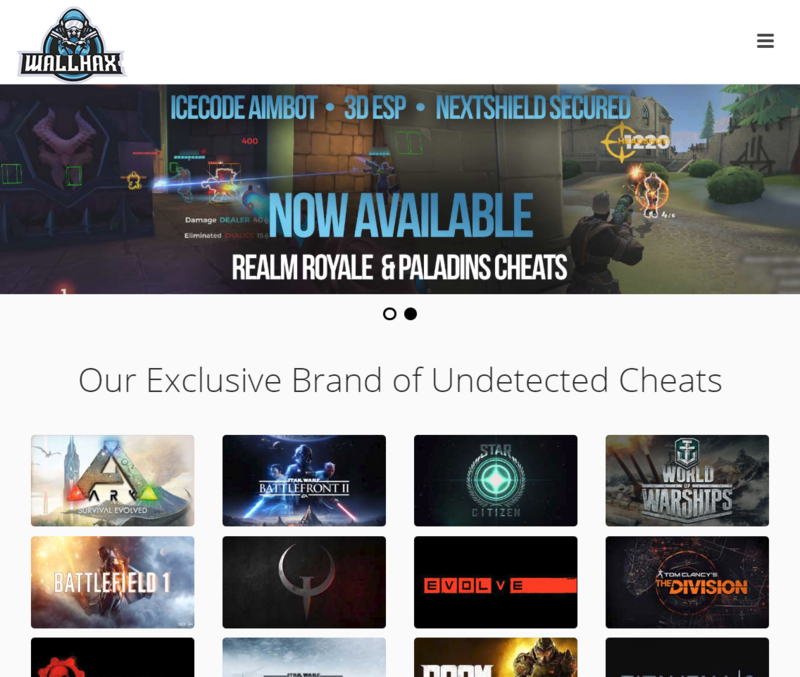 This private cheat provider has been in business for a number of years and has been steadily expanding the number of titles they support. You can get access to 15+ cheats with one subscription, and they support many of the biggest new games, like Battlefield 5 and the upcoming The Division 2. We recommend this cheat provider as many others are quick to ban their customers for complaints, or are regularly being detected in many of the titles they support. If you’re reading about cheating online, you probably already have an idea of why you want to cheat online, but we want to share some of the advantages, and reasons why people decide to start hacking in online games. If you were decent, or already good at a game without using hacks, you’ll see a massive improvement depending on which cheats you decide to use. Imagine that a pro-gamer playing something like CS: GO or League of Legends could see exactly where every enemy was. Their opponents (though good), wouldn’t stand a chance once someone at their skill-level had this information. With features like aimbots that lock on to other players and ESP That let you see the locations of your enemies, your opponents won’t stand a chance against you. You might be getting a bit tired of how long it can take to unlock new gear, items, or perks in your favorite game. Some games like Warframe can require to farm for hours to unlock another new Warframe or upgraded weapon. With cheats you can remove the grind or level up way faster as you kill opponents, capture objectives, and raise your score higher than ever before. It can be really fun being able to enable cheat features in your favorite games. It can completely change how you play and add another layer to a game you already enjoy. Adjust your cheat features to change your challenge. You might only want wallhacks and enjoy having to be a better shot than your opponents. Or, you might enjoy walking around the map one-shotting everything in sight with a ‘rage’ aimbot enabled.